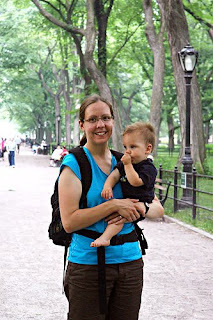 It seems that in my life when summertime hits my scrapbooking time gets put on the back burner. Truth be told, I'd rather be outside enjoying the warm weather, playing with my kids, going camping and on vacation than sitting down in the basement (although when the weather is really hot, it's awfully nice to sit in that cool basement). I take far more photos in the summer and have so many stories to tell so while I'm out making those memories, I can be sure that I'm busy giving myself umpteen hours of scrap-worthy material for all those long, cold winter nights that seem to come far too soon and last way too long. So instead of feeling discouraged that I haven't scrapbooked all summer, I remind myself that I'm just getting myself ready for winter. What memories are you busy creating this summer? Well since we are officially in "wedding season" I thought I'd share a gorgeous card that would be the perfect touch for that special bride and groom! Jillian made this stunning monochromatic card... be sure to pop into the gallery and leave some love! In the summer, I like my life to be uncomplicated and carefree! My family and I are lucky to be included in several fun events with friends and to show my appreciation to the hosts/hostesses, I will often give a small gift card instead of a homemade gift like jam or antipasto. But a gift card itself seems a bit boring, yes? So I challenge myself to create some interesting and fun items to house the gift card. Here are a few that I use quite regularly...and if you have a few that you could share with me, I would greatly appreciate it! One of my favorites is to tuck the gift card into a paper purse. If I have some smaller items to include, I safely store them in the purse too - so items like lip balm or a sparkly pen come to mind. Sometimes I mail my thank you card with the gift certificate to the host/hostess. Here is a card that can be converted into many uses. There is an oversized paper clip book mark in this library pocket inspired card but there is also a Chapters/Indigo gift card clipped with the paper clip. 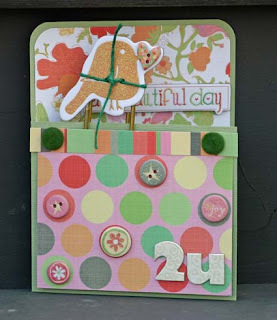 The supplies for this card/bookmark are Bazzill cardstock; Chatterbox (pattern papers, chipboard accents, alphas, brads); twine (source unknown). And lastly, here is a card with an inner panel to house the gift card. An extra piece of paper tacked down makes the perfect pocket for the gift card and a special note. Supplies for the card are Basic Grey (pattern papers, alphas); American Crafts (ribbon); Autumn Leaves (chipboard journal spot); Cuttlebug butterfly die and Glitz Designs (black gems). 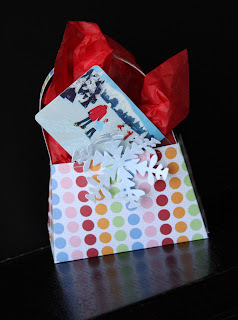 There are lots of creative and fun ways to package a gift card - I hope you will share with me your secrets! What's that they say about being a day late and a dollar short? I prefer "Better late than never" myself...LOL So if you haven't been to the gallery this week run over and take a peek! It is bursting with goodness inspired by the July Challenges being posted in the forum! This one was created by Tara using her own shaped background paper! GORGEOUS!!! I know that we have a stash of these lying around or even neatly categorized in folders. We often store them by color or maybe size. Do you know what I'm talking about? SCRAPS!! You know ... those little tiny pieces of patterned paper/cardstock. I know, I myself, have a whack load of scraps that I keep in folders organized by color and I don't use them up as much as I should. I thought I'd challenge myself to use some of my patterned paper scraps the other day. And that's exactly what I want to challenge you to do as well. Making small projects (home decor, cards, and layouts) are a great way to use up those scraps. Here's my example of what I did. 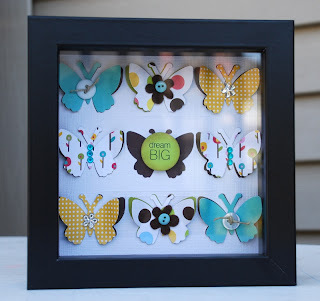 I used my butterfly punch and some American crafts paper. I'd love to see what you can come up with. Please feel free to post it in the Gallery. We'd love to see what you create! Ever since NSD and my splurge of shopping, I've almost avoided the SSZ store. I don't usually feel guilty after making scrapbooking purchases, but this one got to me a wee bit. Do I regret any purchases? Of course not...I love everything I bought, but even I know when to lay low for awhile. However, I couldn't resist for long...I had to take a little peek at the store. Well, there is just so much goodness in there right now that I thought I'd share my 5 favourite finds. I love these bling strawberries by Basic Grey - don't they just scream summer? You can find them here. The June Bug line from Basic Grey just fascinates me - the mix of colours and patterns are so different and surprising. These 'Woolies' have caught my eye - I just love that they're made with fabric and that puppy would be a sweet accent on a page about my recent four-legged addition to the family. You can find them here. Cosmo Cricket has been coming out with some great lines and the Early Bird collection is my new favourite. I love the vintage feel and the chipboard stickers are just to die for. Look here for them! I am sucker for anything Ledger and I just love this die-cut paper by the ever so talented Jenni Bowlin! Here it is!! These are the brown journal sprouts from Jilllibean Soup. Aren't these great for journaling - I could use them up in no time. You can find them here. Since I contained myself for the month of June and it's now a new month, I think I'm ready for some shopping! A girl's got to do what a girl's got to do, right?!? What are some of your recent finds? Happy Canada Day! Hope you have a great day celebrating our Great Country's birthday!! 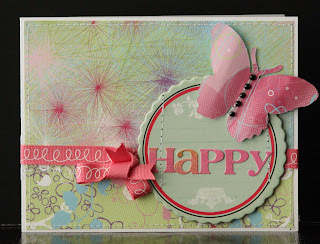 It's reveal day here at Scrap Shotz and the DT has done a fabulous job as always with this month's kit. Full of great LYB papers and embellishments, the Day Trippin Kit is perfect for all those summer vacation shots that will be waiting to be scrapped. We also have a Guest Designer this month. Please welcome Stephanie (Stevie) as our Guest Designer. She did a wonderful job with this month's kit. Well done Stevie!! So make sure that you check out the gallery to see all the wonderful projects with this month's kit. Here is just a sample of the Day Trippin goodness to wet your appetite.